What could possibly be better than killing robots and giant bugs? Oh, that's right, doing it with a jetpack of course. 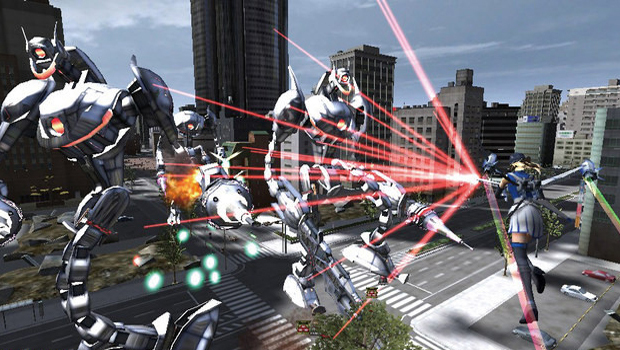 Word comes from Famitsu that the Palewing character from Earth Defense Force 2 will be making a return in the the forthcoming PlayStation Vita release of Sandlot's ridiculous third-person shooter. Prepare to rain down a shower of death upon your extraterrestrial enemies whilst sporting a fashionable miniskirt and thigh-length boots. It might be the apocalypse and everything, but apparently that's no excuse to look frumpy for a night on the town. Earth Defense Forces 3 Portable is coming to PlayStation Vita in Japan on September 27. Hey, D3 Publisher? Can we get a North American release date so we don't have to import this thing?